Home HealthConditions and DiseasesAddiction Are Electronic Cigarettes (e-cigarettes) A Safer Alternative For Young Adults? Media portrays the changing fashion in all its glory and potentially influences health-related behaviors, especially so in young adults when peer pressure is the strongest. One such health behavior is smoking. A recent survey in Canada reveals that the young men and women between the ages of 20-24 have the highest smoking rate. While the younger generation pays a deaf ear to the harmful effects of smoking; researchers say that lighting a single cigarette can have serious adverse effects on young adults. Researchers at McGill University Health Center found that smoking one cigarette increases the stiffness of the arteries in 18 to 30 year olds by a whopping 25%. For us to be able to help our children get out of this habit, it is important to gain knowledge of what happens in our body when arteries become stiff. The main function of the arteries is to carry fully oxygenated blood to the various parts of the body. The arteries have valves in them that stop the blood from flowing in a wrong direction. The arteries begin at the heart and they have to function properly to keep us healthy. There are serious health problems related to the non-functioning of arteries, such as plaque buildup that happens due to too much consumption of fatty foods, high blood pressure, lack of exercise, cholesterol, weight, diabetes and age. On the other hand, when arteries become stiff or rigid, they increase resistance in the blood vessels, making the heart work harder. The stiffer the artery the greater the risk for stroke or heart disease. You may wonder what’s new with these results, as we always knew that smoking was bad for the health and the heart. This study emphasizes the fact that even smoking just a few cigarettes a day can have a major impact on the health of the arteries. You can no longer say; just a couple of cigarettes per day are acceptable. It is not! In such a scenario, the electronic cigarette (E-cigarette) is considered to be perfect solution by many today. It was invented in 2003 by a Beijing-based company. An electronic cigarette is also known as a personal vaporizer. It is a battery device that contains cartridges filled with nicotine, other chemicals and flavor, and provides doses of this nicotine solution through vaporization. In addition to delivering nicotine, this vapor also provides the exact flavor of inhaled tobacco smoke as well as the same feeling and sensation of actually smoking a cigarette, but without the use of tobacco, smoke or combustion. Most electronic cigarettes look similar to a cigarette or a cigar or a pipe, and the most common design is one that looks like a ballpoint pen. They come with refillable and replaceable parts; however, there are also several disposable electronic cigarettes available today. What Is The FDA’s Take On E-Cigarettes? There was a recent announcement by the FDA that their laboratory analysis revealed that electronic cigarettes contain carcinogens and toxic chemicals such as diethylene glycol, which is an ingredient used in antifreeze. This analysis was done with a sample of cartridges from two leading electronic cigarettes brands. They found diethylene glycol in one sample and in the other, carcinogens. 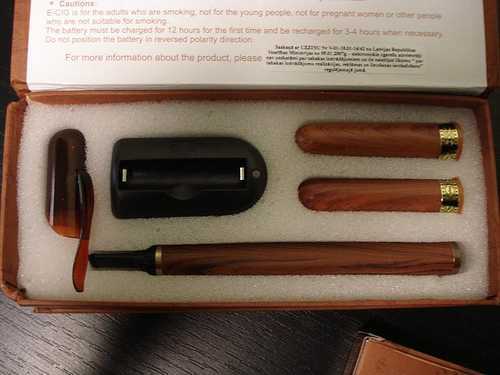 These e-cigarettes are targeted at young adults who can buy them online or in shopping malls. The worst part of the whole thing is that no health warnings are given on these products. They also come in different flavors, such as mint and chocolate that would appeal to youngsters. In conclusion, it is important for everyone to understand that health experts express their concern that these cigarettes could easily increase tobacco use an nicotine addiction in youngsters. Learning all this worries me because when I was in South Africa recently, I noticed my friend’s son smoking an e-cigarette. Guess what! That was a gift from his mother who gave it to him in an attempt to get him to stop smoking cigarettes. As of now things are not really clear about e-cigarettes; although, they are claimed by manufacturers to be a blessing in disguise. It helps to keep our eyes open and see what FDA and other experts have to say in the future when further tests are conducted. Our children’s health is out responsibility! There will be much more to come of this. Many different companies make e-cigarettes and I do think they should be regulated so that a company can’t include additives that don’t need to be added because e-cigarettes are a much healthier alternative to traditional cigarettes (although nothing is healthier to quitting) and properly regulated they really are a blessing in disguise for people who are simply going to smoke no matter what. Not to mention healthier for the people around them and the environment. No more second-hand smoke, cigarette butts, smoke smell, almost zero additional chemicals, cheaper cost, and no ashes. Thanks for sharing. That’s hilarious. So after four cigarettes they’ll just turn into wood. Yet somehow smoking packs of cigarettes per day still takes decades to result in serious problems. What a meaningless scare statistic. Why are you jumping to that conclusion? It’s quite possible that more cigarettes would have little additional effect, but you’re just looking for an excuse to belittle the statement. I started smoking when I was 18 and now I am 25. I tried to quit half a dozen times but it was of no use. I had an exasperated feeling and even couldn’t concentrate on my work. Since then I thought I shouldn’t quit smoking and at that time I felt so helpless that will I never get rid of this smoking..? This thing disturbed me a lot. Honestly saying, smoking is a fatal sickness. Once into this habit, there is no way of escaping. I then came across the concept of e-cig. This was something very new to me. I was a bit surprised but was a bit excited towards it as well. I was in a do or not to do situation. In simple I should go for it or not. I discuss it with my colleague and what she replied was quite surprising for me. She showed a very positive response towards it. She then listed down the advantages of e-cig. On my way back home I bought one, which is jasper and jasper e-cigarette. I use it and since then I am using electronic cigarette. Never thought of going back to paper cigs. Now I am quite satisfied with my this habit, no health complains in fact I feel better in when I breath. I really thank jasper and jasper that it cast away my worries. I use jasper and jasper e-cig and I am quite satisfied with the product. E-cigs are the best alternative of conventional cigarettes. It gives you the desired effect of smoking real cigs without any involvement of risk such as cancers, lungs problems, heart attacks, respiratory problems. Not only has it improved quality of your health in fact you don’t have to worry about the people around you because they don’t get bothered as all what released are vapors. Secondly you can smoke anywhere in pubs, restaurants, in office or at homes. Other alternatives are also available in market such as gums and patches but they don’t fulfill the need of smoking. If its really getting harder for you to quit smoking, go for jasper and jasper e-cigs. What this article fails to point out is that in the FDA test of the cartridges, they found only trace levels of 4 carcinogins that are by products of tobacco. These 4 chemicals were found as very low levels, even lower than those levels allowed in the FDA approved nicotine patch. The diethylene glycol was found in only one cartridge out of 18 from only two manufactorers. At this point one has to question the accuracy of the test. The FDA points out that these results are not indicative of all e-cigarette products. That being said, more and more electronic cigarette companies are buying their “Juice” from US makers insteat of China, specifically for the better quality control in the US. The FDA’s actions may be more political than health oriented. How can anyone compare the 3000+ chemicals in tobacco to the electronic cigarette which has only water, nicotine and PolyGlycol (a food additive). The “least dangerous” choice is obvious and smokers should be provided with this option. You won’t find a tremendous quality product with complete after sales customer services anywhere, but, at JASPER and JASPER. They claims, life is about choice… I am happy that I made my choice right, Thank You Jasper & Jasper. the electronic cigarette is a healthier way to smoke than the regular cigarette but yes the would not reccomend it two those that doesnt smoke..
Electronic cigarettes are not a 100% healthy alternative to traditional smoking. However there is no doubts that comparing to analog cigarettes are less harmful. The most important is to use good quality liquids from checked source. I am using e liquid Eirhorse BH from http://www.electronic-cigarette.ie . These e liquids were tested by CMA Trinity Dublin so I know what I am inhaling.